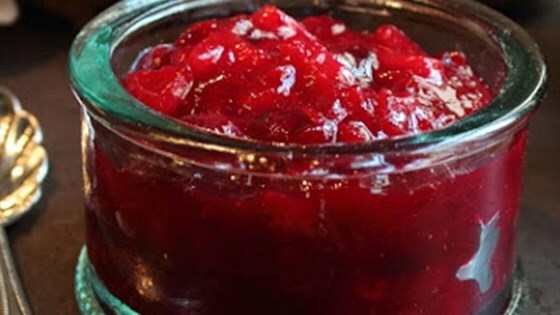 "This gingery, pear-studded cranberry sauce is simply amazing." A luxuriously rich and user-friendly butter sauce! Stir together pear peel and core, squeezed orange halves, ginger peel, star anise, and cinnamon stick with 1 (750 ml) bottle Merlot, 3 cups apple juice, 1/2 cup honey, and 1/4 cup brandy in a 4-quart slow cooker. Cook on Low for 3 to 4 hours. Remove solids with a slotted spoon. Serve warm. Makes about 2 quarts. Good crazy enough. But i would need to share it I could only eat a few tbsp. Very rich in taste. Very tasty. I used several slices of fresh ginger since that's what I had, and I only had half a cup of orange juice so added more water to make up for the difference. This cranberry dish is so so delicious. I made it for Thanksgiving and then for Christmas. And then as a spread for bread or ANYTHING! Next I am going to make it and can it! Nice sauce. Worked well with both turkey and ham. sweet and tart to complement and enhance the savory taste of the meat.